At the former Seminary of the Marist Brothers, Outdoor Pursuits Centre (Casa de Colonies Ca n’Oliver) and Festival Location of MAPA. 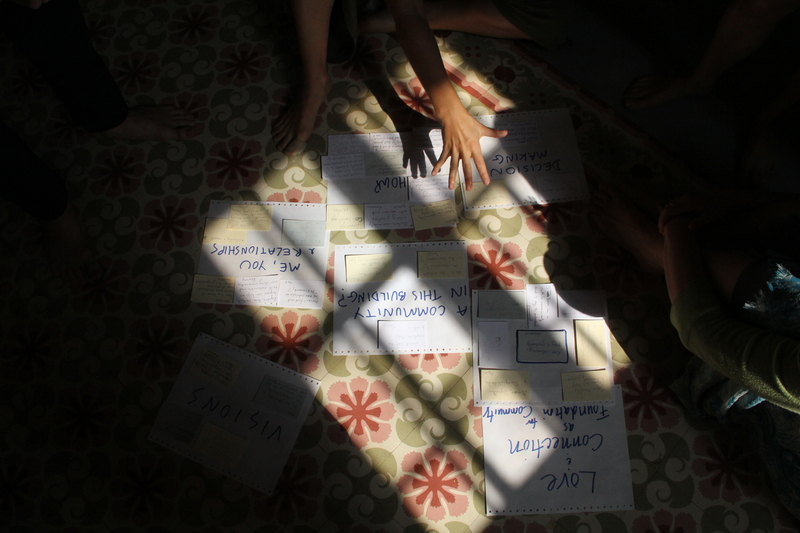 I spent some time thinking about how to summarise or even give a taste of what happened during the two weeks I spent at the Monastery of Dreams, the first week spent preparing for the second, a intensive process of dancing, sharing, performing while thinking, living and imagining community. I realised it would be impossible. The richness of the experience, the fact that my understanding and appreciation is still forming in my being, and that my experience was emergent out of the inter-experience with so many others (some 30 people shared the intensive experience and some 60 people passed through the monastery doors during the two weeks) means that all I hope to do is share what it means to me now. Also the forward momentum of the project and the people who are still in the Monastery now leads me to not want to freeze that moment in time but to offer something that is a contribution to where we go from here. I had an idea to choose one event from the two weeks and use that to reflect on the whole two weeks. 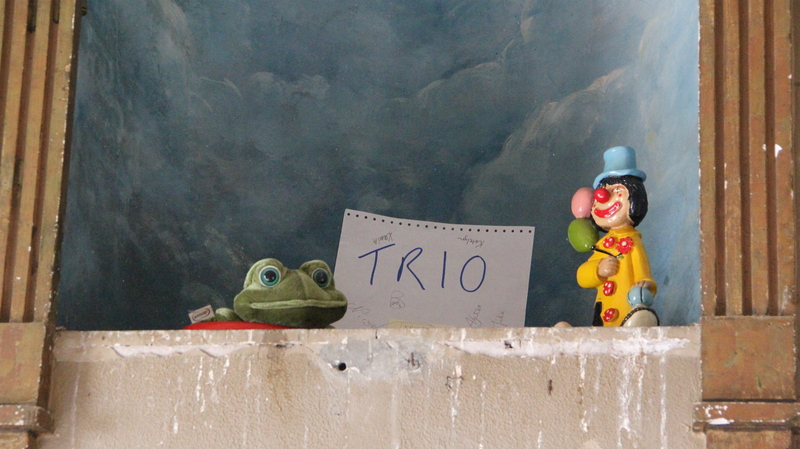 The Trio group guided us into the chapel for an exhibit of their work over the week. 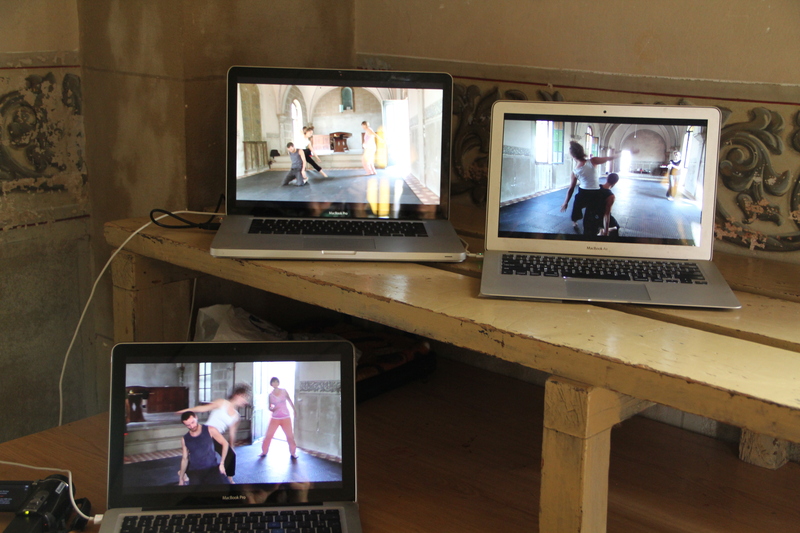 The exhibit included video work using three video cameras. Mesmerizing and moving. 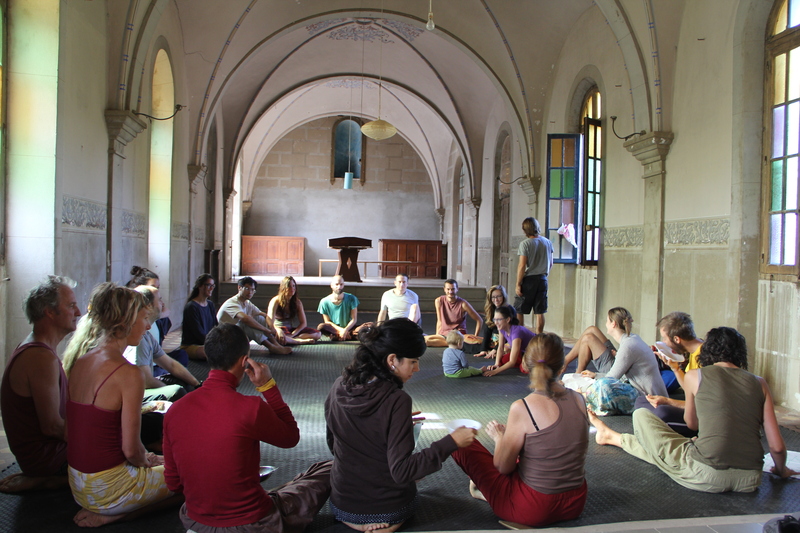 There was the sharing of the intensive groups on the morning of Saturday 8th August when each of the four groups (1. CI, NVC and Family Constellation, 2. The Trio Group. 3. CI in Nature 4. The Performance Group) creatively shared in twenty minute slots with everyone else the outcome of their week of exploration. The humorous and moving ways each group shared through role play, chapel exhibit, moving outdoor performance, and improvised discussion for another performance, involved all of us in ways that went against any simple summary of where each group had ended up after their week of exploration. There was the visioning exercise at the beginning of the intensive week that brought everyone together to establish the groups and the topics to focus on, and the night time work of Jennie to somehow separate all the themes in a way that meant they could be reconstituted in wonderful ways the following morning. Sonja and Jennie plan the morning group forming activity. Forming intensive groups on the second day of the intensive. 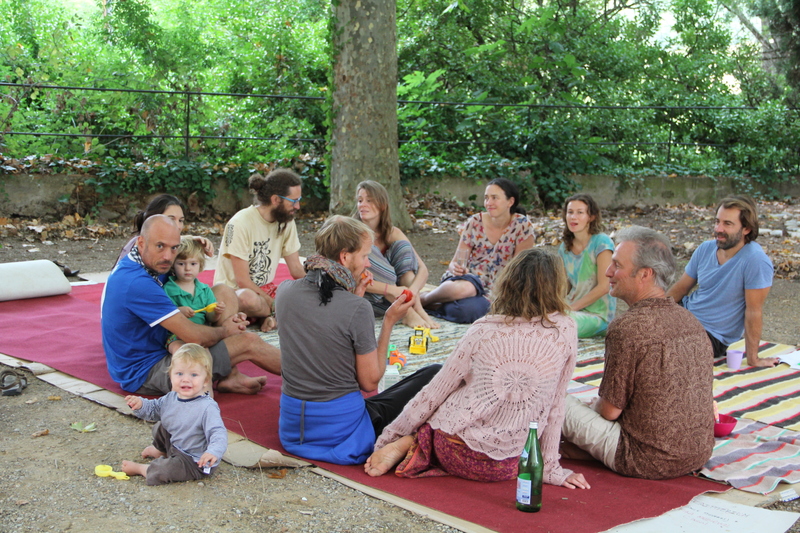 There were lunch songs and rituals that led into long lunches on long tables where conversations meandered between what was happening as our event and all the experiences outside of the community that somehow had relevance to our experiment. These were followed by a wonderfully diverse announcements for offerings in the afternoon and evening. Nirvan’s watsu water therapy offering immediately comes to mind, because after lunch the pool and our resident frogs always had a powerful draw. 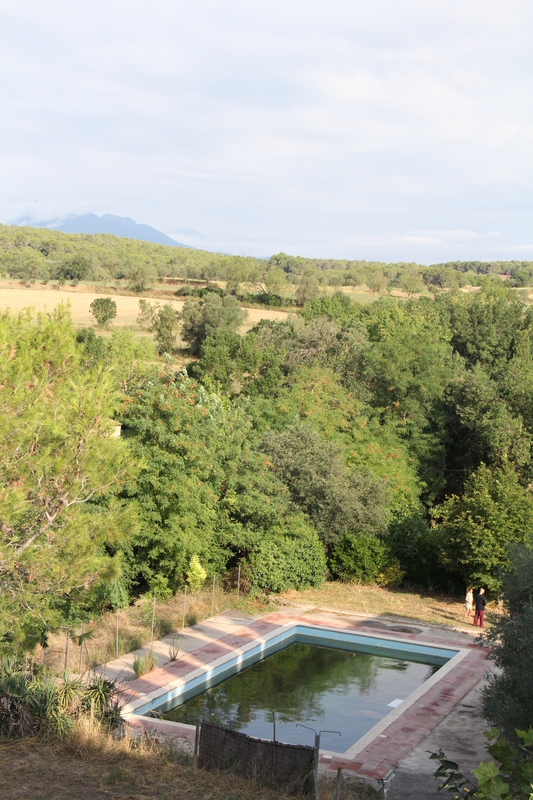 From the roof you can see all the way to the Pyrenees and realise how much of the region is forested. There was our day out on the beach in Sant Marti de Empuries on Wednesday 5th of August, where we started out as three groups distributed on the long sandy beach and ended up by an ancient Greek sea wall eating, singing, dancing and not wanting to leave. An eagerly awaited picnic on the beach by the ancient Greek sea wall (Mol Grec). A sharing of visions before the intensive week with visitors on a similar quest in Catalonia and Portugal, including Kabiro, Daniel and family and partners, helped us realise some of the historical and family reasons for our respective quests for community. But this event did not include all those who attended the intensives so I am slightly hesitant to make this a focus. There was a community visioning afternoon session run by Jashana, Gabriel and myself informed by the writing of Diana Leafe Christian, Jashana’s decades of living in community and contribution to the GEN network, and my interest in allowing engagement with nature and bodily curiosity to help us understand the context for our own visions, and perhaps more importantly share them. 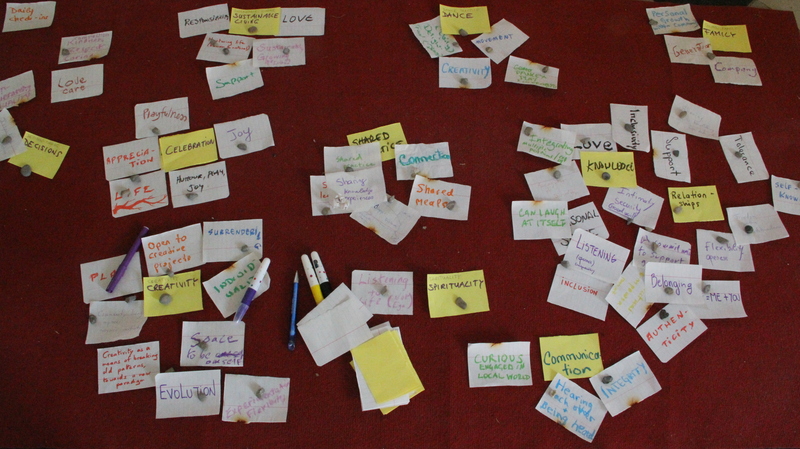 Clustering the key values we aspire to in community. Walking toward the Alien Space. There was the evening performance in the cleared out Alien Space (thank you Nico) early on in the intensive week where the play on indigenous people meeting spacemen engaged us all, and also prompted the curiosity of our nearest neighbour. Walking through the gates of the historically accessible monastery, he was faced by the sight and sounds of naked indigenous people communicating with spacemen through rhythm and music. Asked by Sonja if it wasn’t a little ‘loco’, he replied, ‘No way, it’s liberating’. Our worries of offending the neighbours receded like the tide on a Costa Brava beach as the week progressed as we learned more about how much many of the village had been involved in drama and art projects with MAPA, a drama group, originally from Barcelona who for the last nine years have had Pontos as a base. The large painted Aliens in the Alien space were themselves part of an art project MAPA had facilitated in the monastery over four years. 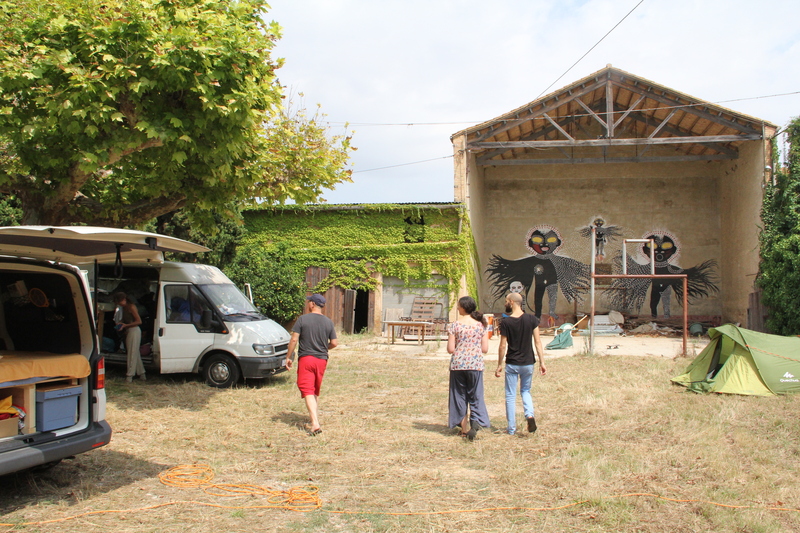 Postmodern theatre had become so embedded in the village through collaborative projects and local kids becoming inspired to go to theatre school, that we realised that many in the village were intensely curious about what was going on here. A morning meeting in the chapel. And of course not to mention the amazing jams in the chapel, theater space and ballroom (formerly dining hall) that enlivened our senses and grounded our learning in our improvised movements. We also explored the Monastery through walking soundings where we sought to experience the many spaces of the monastery by spontaneous walking singing and chanting and in so doing wake it up from three years of no occupation. We hope we reminded it of its long history as we gradually learn more of its history . 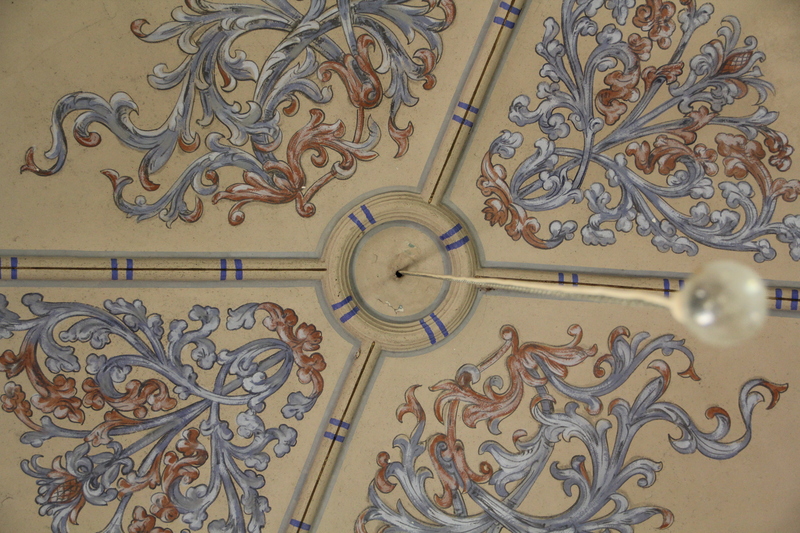 Intricate designs in the roof of the chapel. We are trying to figure out the significance of the blue lines. The building has a long history as a seminary for ‘Hermanos Maristas’ (Marist Brothers), a shorter history as a ‘Casa de Colonies’ or outdoors pursuits centre for children and was used as a venue for artists residencies organised by MAPA over four years. 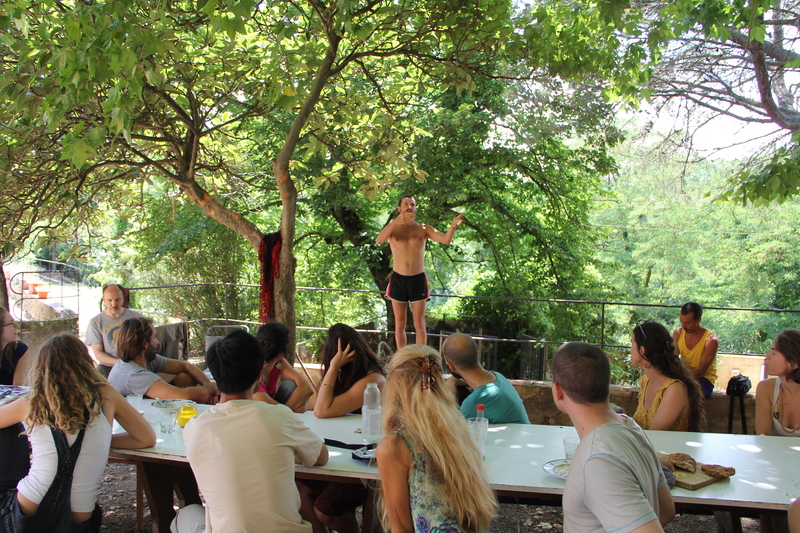 Ernesto and Barbara’s theatre collective and foundation is based in Pontos. [ Check out this amazing sound project that includes soundings from within the building in 2008 (see 33) carried out as part of MAPA project). The are real continuities to the history of the building in the way that many of us see our future there. As a seminary for Marist Brothers it was oriented by a profound aim of international education. There are even Marist links to Tonga (where they established themselves in 1842) before the Seminary was built in 1904. Could we say that we are shifting the focus from a outdoors pursuits centre for children to a community/dance/creative arts pursuits centre for adults (and children). And then the continuity to the creative and participative way MAPA engaged with Pontos over many years, that we would like to continue and be inspired by]. Unexpected meeting of old friends. And of course I have not mentioned the learning and joy gained from workshops, conversations, chance encounters, decision making challenges, talks, sharings, torrential downpours, tears of joy and pain, disappointments, car crashes into wild boar (Obelix would love to live in this area), shopping trips to Figueres, night-time sharing of tahini on rice cakes, etc. I could go on and on. I must also mention that it was not all a bed of roses, that we all faced challenges of finding the balance between listening and leading, productive compromising and assertive contribution, finding the structures of decision making, work contribution that allowed for a balance between personal freedom and supportive agreed structures. 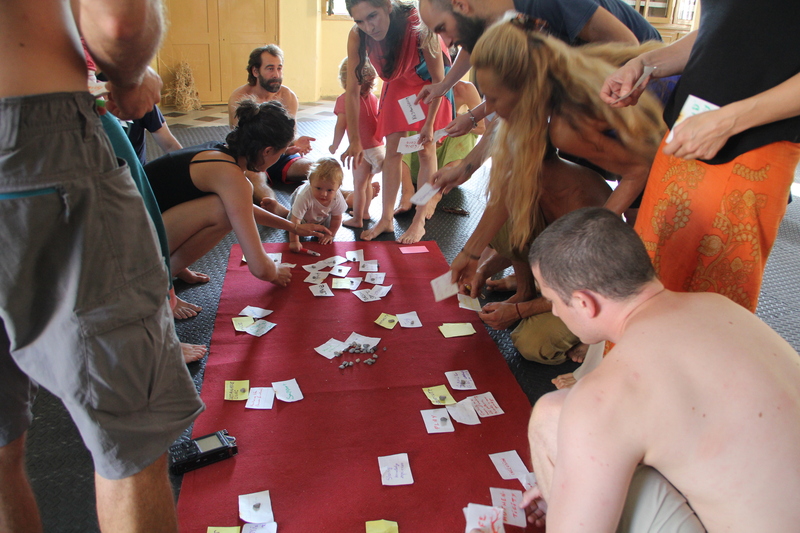 But then that was one of the aims of our experiment, to learn through experience, of how we could create community while learning about how we want to live within and apart from one another. 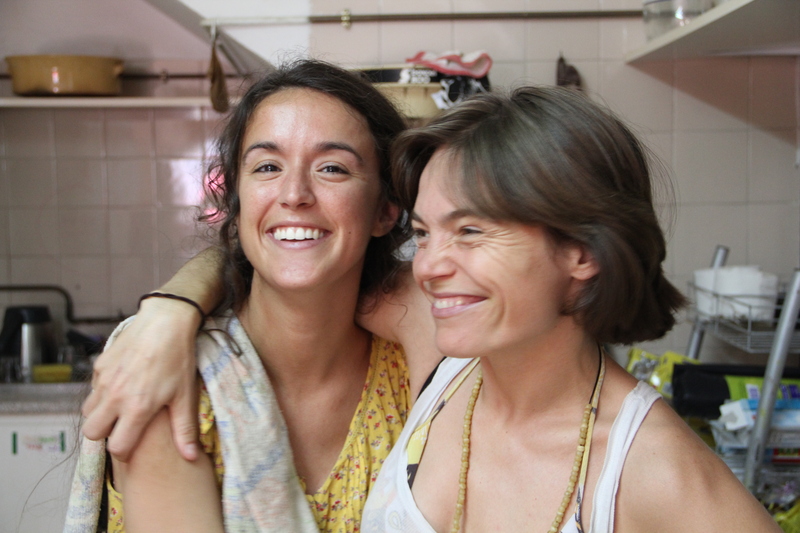 The CI community has always been great at creating strong temporary working communities in jams, festivals and events, but only in Earthdance in the US and in some communities in Argentina have CI dancers decided to live together in a community, connected by their practice. I hope at some point to offer photographs, video and sound to give some insight into all those events above that could have served to encapsulate much of what was so valuable of the weeks at the Monastery. But for now, I want to focus on one event that meant a lot to me and that captured many of the themes of our intensive and our challenges. It was also an event that I need to understand and analyse for my work as an anthropologist committed to the use of video for collaborative research and with the motivation of social change and social empowerment. So by writing about it, I somehow can integrate my work and work for our community project. A screening of Five Ways In. The discussion went on till the early hours. The event was the screening and feedback discussion of Five Ways In, on Friday the 9th August in the evening. Personally, it meant a lot because one of the key characters in the film, Jashana Kippert, was at the monastery, and this was the first time that Alyssa, Sonja and I had seen her since completing the film. She had gone from concluding in the film that at Freiburg Festival there was resistance to seeing CI as political, to returning to Hawaii to fight a two year activist battle again Monsanto against the testing of GMOs. By the time of the screening she had already given us a few talks and shared much of her experience with community building and made a huge contribution to our own community process. There was also something else very interesting for me about showing the film in the Monastery of Dreams. So much of the film deals with the meanings and value we give to CI particularly in relation to the idea of community, the politics of CI and the process of being in an intense festival experience. So here we were showing the film to a group of people in a community in the making, many of which were experimenting with the use of CI and other allied techniques in contributing to dealing with issues in community. The third reason why it was so interesting is because we had invited the local theatre group to attend. The film was the way we could introduce what linked many of us and present it for people who would be very important to us in helping us understand our place in Pontos and our potential contribution. 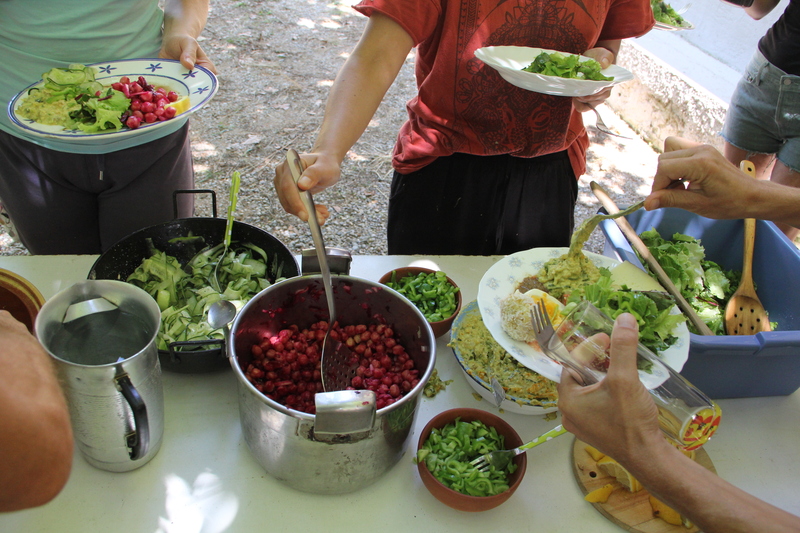 This was the first ‘official’ event that we invited people living in Pontos to, even though they identified themselves as new arrivals and as ‘neo-rurals’. Even the screening was thanks to our ‘neo-rural’ friends. 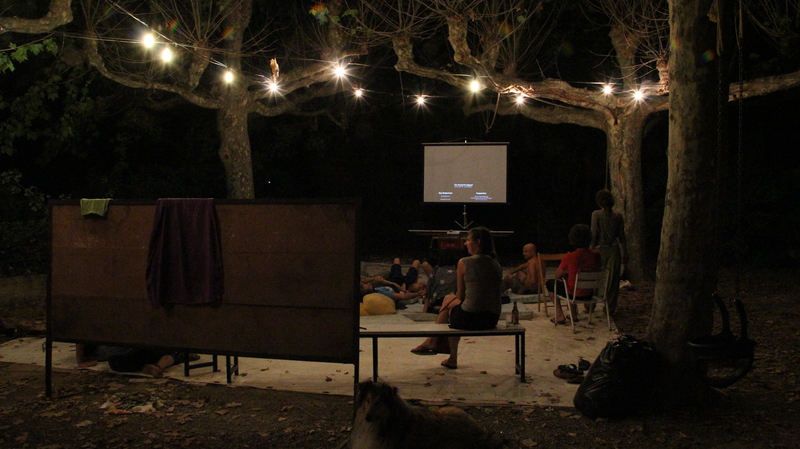 Lize lent us her projector, and Ernesto pulled out a sound system and screen from the community store, near the community centre where many of us had spent a night in our first week eating beans and sausage with the whole population of Pontos. 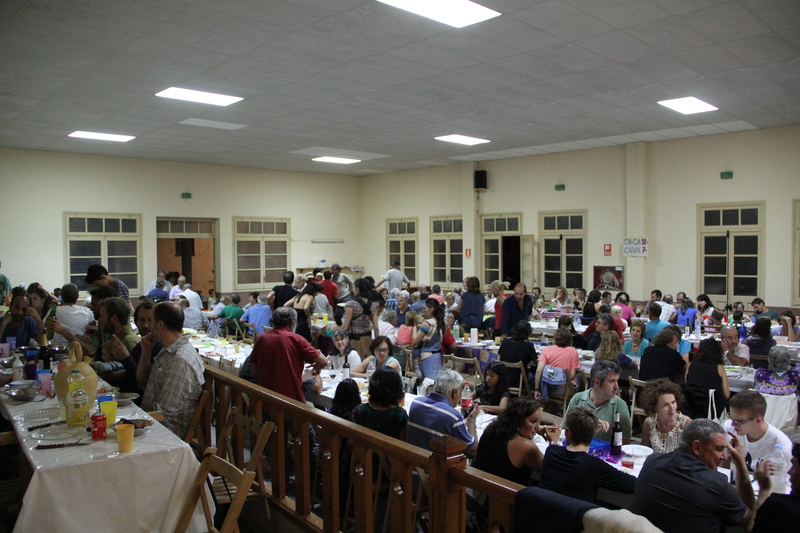 Seeing and being seen by the community of Pontos. Jashana did not want to see herself on the big screen and was also heavily occupied in working with Tatiana and Vianne of our intensive group preparing the 15 minutes performance of a role play that would summarise and evoke the next day the three hour combination of CI, non-violent communication and family constellations that we had used to address a question of community within our intensive group. After the discussion after the screening. Sitting under a line of lights on cushions we sat and discussed the film till 1am in the morning. As people responded to the film they also related it to some of the challenges of building community more generally and our experiences here during the week. Lize’s sharing of the situation of Pontos did much to encourage everyone of the need to engage with the village. (I have made brief summaries below and transcribed sentences and longer passages, but we encourage you to listen to the whole recording. It gives a much better sense of the flow of conversation and the people involved). Mike- We’d love to hear impressions of the film particularly thinking about community? Ben (Free)- I was curious about Lior’s comment about having a role? About breaking down roles between helper and consumer? Gavin-(Deeply, deeply structural—competitiveness and insecurity. Not having a role. There are better structures). Ben (Free)-Impossible to get away from a sense that role is needed? 4.20 Mike- Need to compare CI with other dance practices and the structures. It is also achievement to organise a festival that size. 5.12 Ben-There is a social and cultural shadow. We have got it here. We are creating roles and structure that also has a shadow. Community will come against a hurdle, unless we soften the loosen the structures. 6.00 How the situation is set up is how to be mindful. 7.20 Jashana- I can speak to that. It was pretty courageous for me to go there. I didn’t know a single soul. 11.27 –Alyssa-Just wanted to add that on every occasion I showed the film people commented on how generous you were. 12.00 –Jashana (and it is awkward, ….). 13.00-Sven-I very much liked your research question. Is CI political? One answer, related the person you asked is to find words to not answer the question. (Jess Curtis). He described some things and defined them as political. That is not saying anything in the end. Just an observation. 14.00 Mike-What do you feel would be political? 14.09 Sven- It is a question that every community can ask to themselves? Political for me is try to influence the outer world of a community at first. Greater range, greater frames, which means networking with good people. To influence the greater system of society. But it difficult because you put so much energy into the community, so it is not easy to get this broader frame in mind. Gabriel, for example, wasn’t able to take part in the group because he had so many other things to do. 15.37 Jashana- I would like to speak to that, because surprisingly the last two years I have been in the Hawaian island and chose to take on a political issue. (Monsanto, ). 17.40 Lize- [Asks for clarification]. 18.10 Igor-There are people who are just activists, just dancers and those who do both. 18.28 Ben –Jashana, what do you think about Jess’ line. So the idea that we change consciousness and expand our awareness, and that can ripple out. Like for me the potential of that can save us on this planet. If we can expand our hearts and share that, that is what is going to change it. I’ve done some actions, I’ve been to demonstrations, I’ve had police beating me but it is part of the picture but it is not going to do anything on its own. I think he did answer the question as best he could. I think he is a seriously political mind. That’s my experience of him, he’s trying to take in the big picture. I first came across Dani because we were using contact in a political action in London. (CI community, political action in London, camera shot from miles away, activism become quite separatist ). 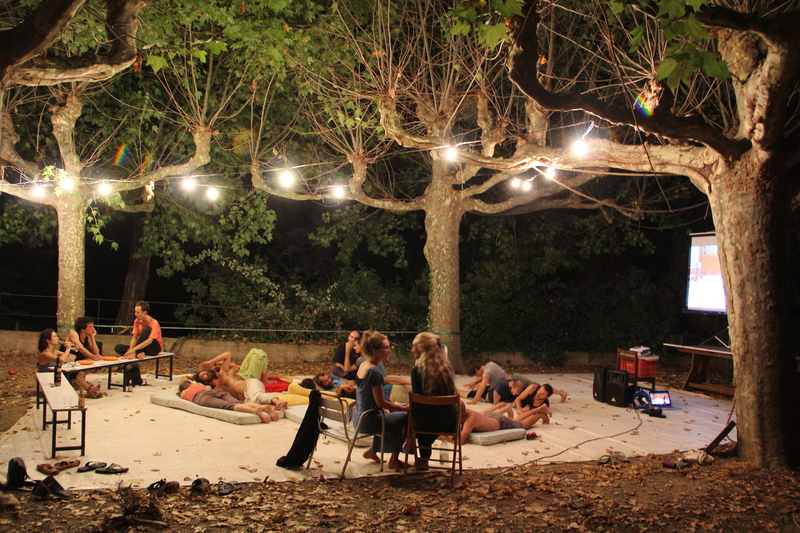 21.35 Jashana- Talks about the bathrooms in Freiburg Festival, how does it reflect the disconnect between community awareness (If I am connecting to you in an intimate moment, why would I even leave that mess for a helper). 23.29 Mike-So I have a romantic idea that people are in another state of consciousness so the cup is not so important at that moment. 23.50 Gavin-expansion and contraction of consciousness in CI. 24.25 Mike-It’s also a temporary space outside of everyday reality, it’s kind of a carnival space. We are not at home, that’s precisely the point, so sometimes the rules of tidying up and toilet paper just fall by the wayside. 24.55 Mike-I see the festival as more of a transformative space, which for many it is, you enter into a week long festival and you come out of the festival really transformed and all the nitty gritties are part of the negative stuff of transformation. Jashana came out of it with really key insights into whether you wanted to use CI or not (it is a transformative, reflexive and critical spaces). 26.50 Nelly- I think it is the time. I think if you think of us being here two months we wouldn’t have to speak about bringing a glass back, we will develop it on our own. (acceptance of time, just imagine what has happened her in two weeks, growing community after a while is just living). 28.13. Igor-I think to start a community is never easy. Today we don’t know our neighbour, we don’t know the people from our own village where we were born (what some people value others don’t, why many communities fail is because of human conflict, we have to accept that every single person has a different culture, acceptance and giving it your best spirit). 30.26 Nico- For me what I hear it to be aware of the space (goodwill, act for others, trust, awareness of the space, CI looking inside and mapping awareness of space through the dance). 31.20 ? So it is political, contact? I don’t know if political is the word, but I know that dancing contact has consequence. In your own community. No-one can dance contact and remain the same. It has consequence and that’s nice, no? I have just arrived and I can see consequence. 32.40 Lize’s partner-Maybe I am wrong, this is the first time watching the contact community but I think the most important things about the community are outside of the dance. Now you are living here, and spending nights and days and it is not only dance, there are many things. In the case of Pontos, lots of relations with the village and the area. Its really nice to see how the people can dance and contact with other people but the good thing of that is not only in relation with the people who dance but with the people in the village and all around. 33.51 Lize-it is like a big secret what is going on. It would be nice if you could do a workshop in the middle of the place (Plaza). 34.00 Maybe you can dance in the middle of village, I don’t know? 34.10 Jashana-but it can look really weird. It feels great. One of my concerns of dancing in the village is that it could scare some people off. 34.40 Lize-this is a very special village, they have for four years seeing all kinds of performances. There is no way you will shock them. No way. Maybe in another village, not this special village, the centre of MAPA. No problem, they are just used to it. (for two years no performances, but the previous four years, residencies in the monastery, involved the village, amazing stories happening, children from the village became actors because they had this experience as the child). 36 Jashaha-This is most encouraging. 36.10 Sven-(talks about street improvisation and music) There is no reason to be scared. 36.50 Lize-you might not expect them to participate [in the dance] because they were used to the performance part. It was a festival with residents . During two weeks, artist came and they made the piece with the people, and sometimes with a video artist, a horror movie (artist from Holland, dressed up as Zombies). It is not so long ago. Talk to Ernestor and Thomas who are the organisers of this festival. 38.07 This will take time, we have just arrived. We are just starting to perform. It will happen if we are here for a longer time. 38.20 Nelly (talks about a festival in Bremen with outdoor performances, taking CI to the public, each time the reactions are different). I love to go out. 40.00 Lize-Do you need this comfort zone? You have this big square, do what you do inside outside. People will say, yes they are dancing. Break the mystery. 40.30 Mike- You said open secret. What is the open secret? What are we doing? 41.15 Igor-I’ve done CI many times in the street. 41.42 Lize-You don’t even have a police officer in the village. It is perfect place to do it. ——More discussion about the performance? 43.00 Jashana-Shall we go out this Sunday? 43.10 Laurence- What is interesting for me in this conversation is what we are doing is not about performance it is about research. Somehow we are sharing the results between us, our research about contact and community. 44.01 Lize-This is not the aim I am asking. I don’t say that people want to be entertained. It’s just, you are part of the village. We are very few people. Just like they know what you are doing. That’s it. Just by seeing it, ( ). 44.23 Mike-A jam in the square would do it. 44.37 You don’t even have to announce it, just do it in the square. (discussion, Jashana, CI looking bad). 45.13 Lize-Something that break open the what are they doing, who are they? (Lize, we just didn’t know, was it a Agricola community, like Can Masdeu). 47.04 Lize-This is the village to do it, because it has this history. 48.04 ? 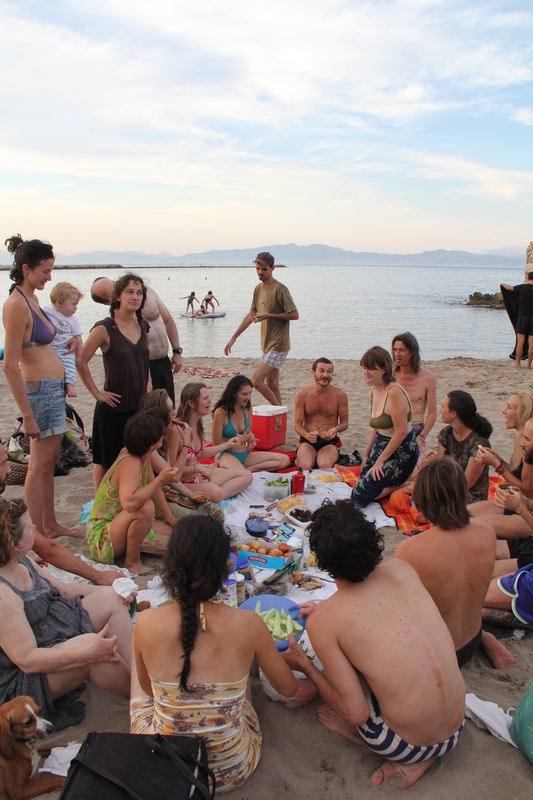 -Music is opening (discussion of carton jam on beach, music and jamming, places to engage with public, Barcelona, difference between music and dancing CI in how open it is to others). 50.49 Igor (gossip goes very fast in these kinds of villages, gossip in one of the most dangerous things ever, important if we have a chance of being place like this, impotant for the communication of the project that the people in the village don’t feel weird about what is happening here). 52.00 ..You have co-ordinate, you have to announce where. (discussion about culture of the Alt Emporjda, take out the floor, professional). Lize (we are a bumper between you and the other people). 55.00 Lize/Sven/Jashana (Further discussion of how people noticed us at the beginning, of how to organise an event, how kids could try, start with the kids, also good for the community to step out (political action? ), internal spirit that is created in doing this, going out, inviting people from the village to come in, depends on who you invite, there are different kinds of people in the village, Lize (we connected to almost everybody in the village). 1.00.21 Thank you, we are very grateful. 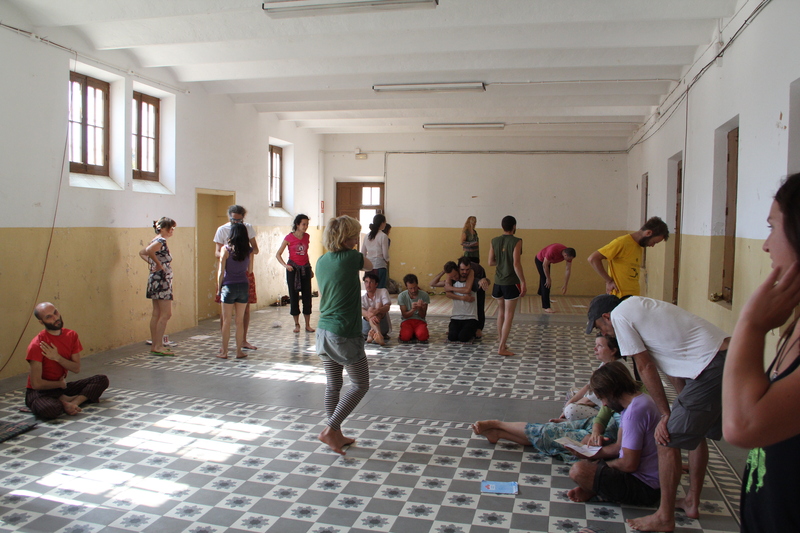 UPDATE: On the 16th August we ran a contact improvisation demonstration event in the main square outside the monastery to which about 30 people of all ages from the village came. Pel costat dret d’aquesta creu hi ha un camí que duu a la casa de colònies de Ca N’Oliver. Antigament fou una casa important, anomenada Cal Monjo. Després es convertí en un seminari marista I actualment és una casa de colònies. La façana més antiga presenta una finestra gòtico-renaixentista (s. XVI) amb uns bustos humans tallats amb gran perfecció. Del festival mapa no encontrado la web, pero me acuerdo de este festival y había info colgada, entorno site-especific, desentralizando la danza i artes de la ciudad, involucrando bastante a la gente del pueblo. La compañia de danza DOCTOR ALONSO es conocida, no súper conocida, pero un poco sí. Es una de las mujeres que estaba por allí. This is one of the products of the MAPA festival. is the plan to buy/live at the monastery long term? We are still in the process of planning…but one plan is to rent the property for a longer period next year to explore the possibility of other options. To be able to do either requires longer research and relationship with the village and with the owner. Hello I just arrived home yesterday evening and I am currently recovering from the wonderful intensity of Freiburg! I am inspired and enjoying also the quiet time to be on be own, to digest and reconnect fully with myself… It’s great to read what you have been exploring together. Will you be extending the rental any further into September-october? I am really keen to come and experience the place and to be involved in this research project. I am planning to go to Dance you Questions in Arlequi at the end of September 27th-oct 4th and I could come before or after.